Natural hair will always look untidy, and most women will prefer to blow dry their hair to make it easy to style and comb and look more admirable. Since the beauty of a woman is in her hair, she will do anything to make sure that her beauty is not compromised at any one time. Whether they have short or long hair, they still try to make it look neat at all times. Blow drying is one of the ways of helping the retention of the beauty in all aspects. To ensure that the hair does not break or frizz there are some ideas which if you either do them or don’t do them as per instructions, then the hair will not break at any one time. The below points elaborate the do’s and don’ts of blow drying your hair. 1. Application of oils- DO apply the essential oils- Before you start blow drying your hair, it’s important to apply some oil like the coconut oil, olive oil which is readily available in the cosmetics and beauty shops all over. This is important since it will prevent the hair from breaking now and then. One may fear to buy them, but one fact about these oils is that they are cheap and very affordable for people of all classes. When applying the oil, avoid applying in the scalp to avoid getting burnt with the blow-dryer heat when blow drying the hair. Start applying a few inches from the scalp and ensure that even the tips of the hair are applied. The reason for this is because the edges are the ones that get affected easily and breaks easily because it’s very light at the edges. 2. Heat setting-DO set the heat at a low temperature-Since heat is not good for the hair strands, use low temperatures which will work the same as the one with the high temperature so long as you operate it well. When using low temperatures, there is no need of trimming the edges of your hair now and then since it does not break anyhow. 3. While the hair is still wet, DON’T brushes your hair- The reason behind this is that wet hair usually is fragile and can easily break and get damaged while combing. Therefore the best way to do it is to blow dry the hair before you brush or comb it. Whenever you comb the hair when wet initiates more hair falling. If the hair is so wet, use a towel to pat it dry but ensure you leave it a bit dump for the dryer to penetrate through the strands easily. When through with blowdrying, and depending on the type of your hair, you can use your fingers to try and set it to your desired style without pulling it hard. 4. DON’T be too mean on protecting your hair against the heat- Most people use a lot of heat while styling their hair which is not necessary. If you must style your hair while drying it, then use a heat protection serum to ensure that the hair remains healthy and beautiful at all times. Also, ensure that you apply conditioner before blow drying it to make it soft and this will avoid hair breakage to a great extent. 5. DO trim your hair once a month- When blow drying, the ends will still become weak and its recommended that the edges need to be trimmed once a month to ensure that the hair maintains its strength right from the roots. 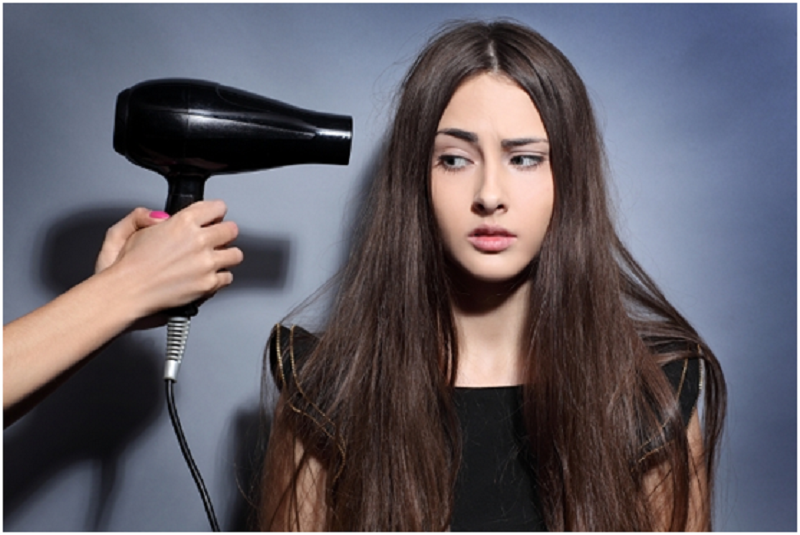 Lastly, use lower temperatures when blow drying your hair-This will make it last longer and healthier.